The Tracy Brown Chronicles: Class is in Session! One of my favorite quotes is "Actions speak louder than words." Don't get me wrong... I'm a writer, so I recognize the power in the spoken and written word. But, so many people 'talk a good one', that I find myself looking past what people say and, instead, watching what they do. I also pride myself on learning something new each day. It could be something as simple as a new word or as complex as a new spreadsheet trick in Microsoft Excel. But each day I try to open myself up to a new lesson. After all, isn't that what life is all about - growing, learning, evolving? These two principles came colliding full force in my life recently. While dealing with one negative situation after another with one person after another, I found myself feeling very weary, incredibly disappointed and supremely frustrated. I was beginning to feel like "running away" from it all, ostracizing myself in a cocoon of seclusion to shield myself from all the unnecessary melodrama and nonsense. This happens to me over and over and over again. I isolate myself from people and situations that drain my energy. I withdraw until it seems that the coast is clear. Then I reemerge, and at first it seems cool. But soon I'm faced with the same crap that I ran from in the first place. "You are treating people like true friends when they are true acquaintances." "You have got to TEACH PEOPLE HOW TO TREAT YOU." Priceless! I felt like a huge light bulb lit up over my head when she said these things to me. It sounded so basic, so obvious, and yet it was the most profound sentiment that I've heard in ages! And it brought the two principles I spoke of earlier into clear focus for me. Actions speak louder than words. I had been talking, talking, talking. I talked about how fed up I was with the nonsense. I talked about what I would do differently going forward. I talked about and complained about the way that people were acting towards me. But my friend said to me, "Too bad, so sad! If you want to change the way things are, then you have to teach people how to treat you." She was absolutely right. I know that at my core I am a good person with good intentions. I like the person that I am. In fact, if I was somebody else I would want me for a friend! I'm the type to examine my actions in a situation to see if I could have done anything differently. And when I examined myself in the course of recent developments with acquaintances, I could see where I had gone wrong. When I found an error in my judgment, I apologized and resolved to do better. When I found that I had been inconsiderate, I acknowledged that. But these same people weren't apologizing to me when I felt slighted. These same people weren't examining themselves objectively the way that I was. I felt fed up, angry, and most of all hurt by the bull$#!& being tossed my way by people I cared about. So my dear friend's words echoed in my head long after she and I parted ways. I was talking a good one. But I wasn't acting on it. I was verbalizing what was bothering me, but I wasn't doing anything about it. How many women complain about the man in their life, but they never take any steps to leave him? How many men complain about being taken for granted on their jobs, but they never make any demands for better treatment? I was guilty of the same thing. It was time to show and tell, time to teach people what is acceptable and what is not. The lesson hit me so hard that I began acting immediately! I determined who were my actual friends and which ones are really just close acquaintances. I was actually surprised by how many folks I had absentmindedly dropped into my "friends bucket" when they hadn't even met the qualifications yet! I was confusing familiarity with friendship. Trust is earned, not given away for free. And it was time for me to reclassify some of the people who I had allowed into the VIP section of my life. Once I was done recategorizing, I found my "friends bucket" nearly empty and my "acquaintances bucket" overflowing. That was more like it! I began to establish what my boundaries would be with regard to these acquaintances, and I felt my power coming back, my shoulders squaring, my spine straightening. I was NOT going to be broken by a few misplaced folks. I simply had to reorganize, refocus and begin to teach folks how I expect to be treated. An "AHA" moment for sure! Since actions speak louder than words, I would have to show them better than I could ever tell them. I turned my frown upside down, put on my big girl drawers and wiped the slate clean. Time to start anew, with friends and acquaintances properly categorized, my VIP section a lot less crowded, and my boundaries clearly set. And now I am ready to take on the world again. 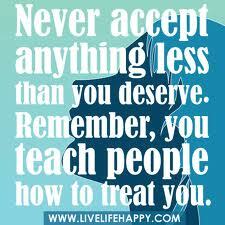 "You have got to TEACH PEOPLE HOW TO TREAT YOU." I had to post these quotes on my desk at work. I seem to have a lot of friend issues and like you I looked deep down in myself to see what my issues are and i'm convinced that for the most part, it is them. So instead of always accepting them back in my life as a friend, i'll just treat them as a acquaintance. Keep the blogs coming. I love them all!